In Edge of the Abyss, a supplement for Rogue Trader, detailed descriptions of the Expanse’s famous worlds allow players and GMs to plan new Endeavours and adventures. Fight across the frozen surface of Lucin’s Breath, plunder the Egarian maze cities, and plumb the secrets of haunted Illisk. Study, negotiate, and war against the inhabitants of the Expanse: xenos races, the vile forces of Chaos, and monolithic Imperial organizations. Edge of the Abyss offers in-depth descriptions of several important locations in the Expanse, including some never-before-revealed worlds. Additionally, you’ll find background information, statistics, and ships for the most powerful alien races and organizations of the Expanse. 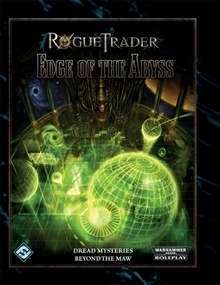 Get Edge of the Abyss and all of your Rogue Trader eBooks at RPGNow.com!